• Going into the game knowing that Ozzie Alonso would not be playing, I was interested in seeing how the middle would shape up. Michael Azira & Gonzalo Pineda did an excellent job working together, and I don’t remember a time where either of them were terribly out of position or were their passes out of line. Azira sat deeper and got forward less than Ozzie does, but that freed Pineda up to get forward, and gave Marco Pappa space to cut inside and cause havoc (see the Sounders 3rd goal). • Another pregame interest of mine was the Centerback pairing of Chad Marshall & Brad Evans. Chad Marshall, the 2014 Defender of the Year, played up to his bill. There was little question about him. The intrigued centered on how Brad Evans was going to do in his new position. Aside from a bad pass that led to a Save of the Week nomination for Stefan Frei, Evans did vey well. • I didn’t think the attack could get more exciting than last years team, but judging it by this game, it has improved. There was no preseason lull to shake off. Of course Clint & Oba were doing Clint & Oba things, but the part of the attack that really impressed me was the wing play. Marco Pappa & Lamar Neagle started the game inverted, and stayed that way for most of the match. They stayed a lot wider, which freed up space in the middle, allowing Oba to drop into a No. 10 role. 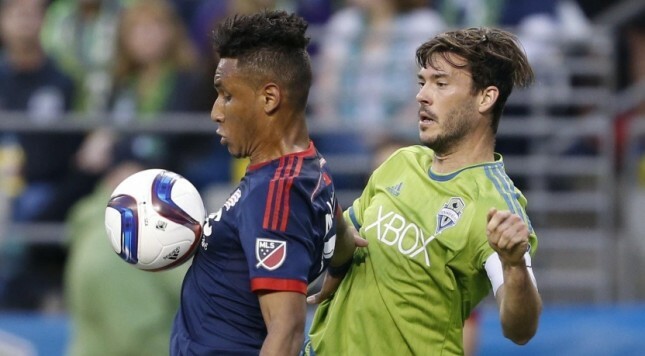 All in all, it was a really impressive match from start to finish for the Sounders. Exciting things are happening in Seattle.